Though I am firmly against believing that an offseason exists I do realize it does exist for some. With that said, we can all agree that the offseason is over and football is finally here. It is only Week 1 and it already feels like the football season just is not long enough. Those baseball and basketball fans are so spoiled. We get 16 intense weeks to work with for the regular season. It simply never feels like enough. We need to value the season why it is here and understand we only get so many chances to pile up enough wins in our fantasy leagues to get to the playoffs and ultimately the championship. Our respective paths to the fantasy Super Bowl start with Week 1. All fantasy football decisions start with targets and snaps. These two simple statistics are the most logical and fundamental aspects of our game. The more a player is on the field and the more opportunity that player is given, the better the chances are that player will rack up points for your team. The more points your players score, the better your chances are of winning. The more you win, the more money you get. Simple math! As the season progresses we will accumulate data that we can apply to future weeks. Analyzing players for Week 1 requires us to look back on last season and determine what trends may carry over to kickoff of the 2017 season. I sort through the data and share my observations while encouraging you to pour over our stats pages and make some determinations for yourself. You can find all of the data relevant to this article in the links below, which are updated weekly. •	Brown also led the league in receptions last year with 106. The only other player with over 100 catches was old reliable himself, Larry Fitzgerald with 102. He bested Browns’ catch rate with a 71% completion percentage and turned in his second straight WR1 season. Fitzgerald faces the Detroit Lions this week, who were ranked 28th against the pass in 2016. Cardinals’ receivers do not have an unfavorable matchup until they host the Seattle Seahawks in Week 10. •	Greg Olsen (125), Kyle Rudolph (117), Travis Kelce (113), and Dennis Pitta (105) were the only tight ends who saw more than 100 targets last season. Olsen accounted for 25% of the Carolina Panthers’ targets. They have arguable the easiest schedule in football this season. Rudolph, 2016’s TE2, is currently being drafted as the TE8. Kelce, 2016’s TE1, is currently being drafted as the TE2. Rudolph and Sam Bradford’s rapport will carry over into 2017 and is the discounted TE that you want. If you are looking for a further discount you can expect Ben Watson, TE30 in ADP, to absorb Pitta’s target share. •	You don’t need me to tell you about the David Johnson (116) and Le’Veon Bell’s (93) target totals, but you might not be aware that James White’s 82 targets were the third most of all running backs last season. Duke Johnson (74) and Bilal Powell (72) were the only other running backs with at least 70 targets. Johnson is expected to play the role of a slot receiver with an RB tag this season. He will be tested on any routes he runs from the slot by veteran corner William Gay, who allowed the second fewest yards after the catch from the slot in football last season. •	The six points awarded for a touchdown are the single highest score a player can achieve in fantasy. When you throw the point for a reception in there, the seven points awarded for a receiving touchdown is the money maker. 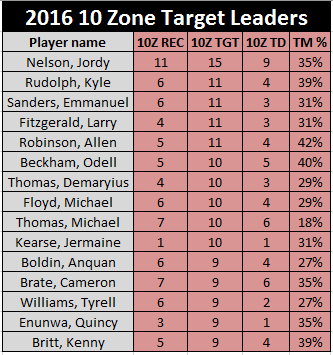 Below is a chart of the statistics associated with 2016’s red zone target leaders. 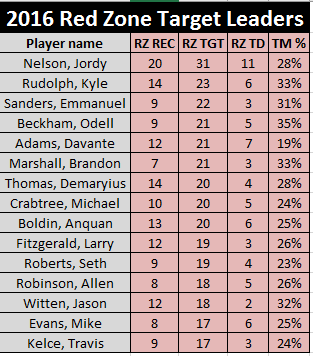 •	Jordy Nelson led all players with 11 red zone touchdowns while Odell Beckham led all players with 35% of the teams’ red zone targets. Brandon Marshall, who trailed him with a 33% red zone market share, was signed by the New York Giants this offseason. The red zone battle between these players remains to be seen, but with Beckham shaping up to be a game-time decision and the Dallas Cowboys having a week secondary, Marshall is a near-lock to score a touchdown this week. •	Targets from within ten yards are far more valuable than those from the 20, and the statistics associated with 2016’s ten zone target leaders are below. •	Jordy Nelson not only dominated from 20 yards out, but even more so when the Green Bay Packers were near the goal line. Nine of Nelson’s 11 red zone touchdowns (14 total on the season) came from the ten zone. He is the undisputed top red zone threat in football. An interesting observation here is that of Jermaine Kearse vs. Quincy Enunwa. With Enunwa done for the season and Marshall out of town, the newly-acquired Kearse could be a sneaky bet to see 10 zone targets. The game against the Buffalo Bills this week could be unwatchable, but Kearse is a candidate for a GPP play with touchdown upside. •	The preseason very clearly displayed how much Allen Robinson’s ceiling will be capped this season as long as Blake Bortles continues to play quarterback for the Jacksonville Jaguars, but he is “the guy” in Jacksonville and his 42% target share in the ten zone provides a sliver of hope. The Jaguars are 5.5 point road underdogs the lowest implied total of Week 1 (17.25). You are likely starting Robinson if you own him this week, but you are praying for a touchdown. If you read this column at all last season (thank you!) then you know I wrap it up each week by reminding you that these are my takeaways from pouring over our stats pages and I encourage you to do the same. When you take an analytical look at the various numbers available to you then you can find your own edge in certain statistics that pop out at you. My goal is for you to read something that I discovered and for that to trigger your light bulb to go off and dig around for more. Remember to always check our multiple tools and stats pages as they update each week, and you can always reach me on Twitter @FFdeJENerate (https://twitter.com/FFdeJENerate ) with any questions or comments. Good luck this week and cheers to the 2017 season!